The WWII-set Air Strike will still be getting a U.S. release despite the film being scrapped in China, according to Deadline. Earlier this week, the film, which is also known as The Bombing and Unbreakable Spirit, had its release date in China pulled after the production was accused of artificially inflating its budget for money laundering purposes. Director Xiao Feng previously wrote on social media that it was “time to let go” of the production he’d spent eight years working on. However, Lionsgate, which has nothing to do with the Chinese release of the film, will be proceeding with Air Strike’s theatrical and VOD releases in the U.S. starting on October 26. The film’s complicated backstory is believed to tie in with the financial troubles of co-star Fan Bingbing (X-Men: Days of Future Past, Iron Man 3). The actor was also accused of tax evasion, which pushed the release date of the film from its original August release to one in late October. After she was scrubbed from the film’s marketing and promotional materials in China, the actor issued a public apology and will be facing a hefty government fine. Air Strike is Chinese war movie based on the infamous attacks on Chongqing during WWII, which included a total of 268 air raids from 1938 to 1943. 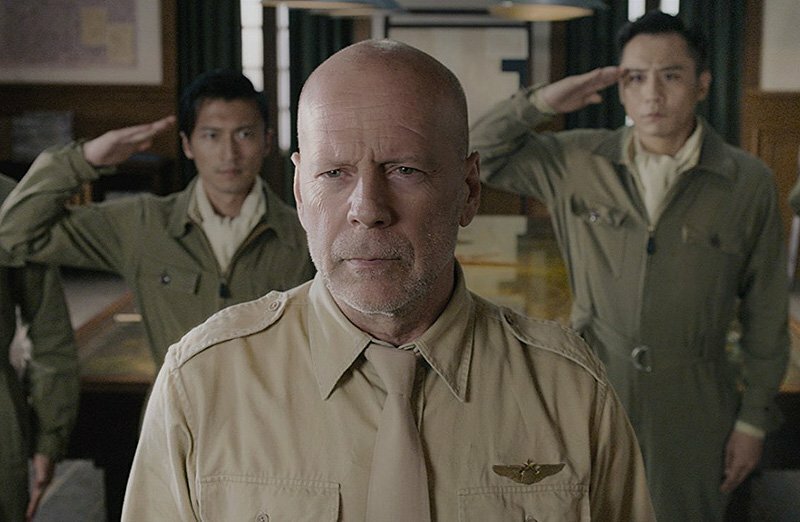 Willis stars as a USAAC advisor named Jack Johnson, who trains the Chinese people under harrowing conditions to battle against the Japanese and leads his own aviation squadron against the trained Japanese Air Force. Adrien Brody, Liu Ye and Nicolas Tse also co-star.